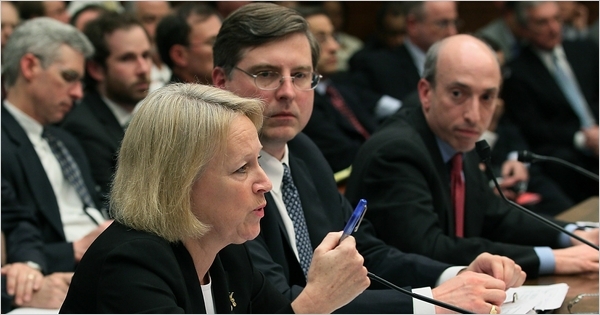 Mary L. Schapiro, chairwoman of the Securities and Exchange Commission, during a House hearing Tuesday on Capitol Hill. WASHINGTON — Regulators examining the causes of the brief stock market free fall last Thursday are looking closely at heavy selling in the market for stock-index futures by a single trader, beginning 10 minutes before stock prices began to plummet. Gary Gensler, the chairman of the Commodity Futures Trading Commission, said at a Congressional hearing on Tuesday that during that crucial time period, the futures trader, whom he would not identify, accounted for about 9 percent of trading volume in the most actively traded stock-index derivative contract, known as the 500 e-mini futures contract. All of the trader’s orders were to sell, Mr. Gensler said, while most of the other 250 traders who were active in the same market that day were both buying and selling securities. As the trader’s orders went through, the futures index on the Chicago Mercantile Exchange began to plummet. The identity of the trader remained unclear. Terrence A. Duffy, executive chairman of the CME Group, which operates the Chicago exchange, said on Tuesday: “We obviously won’t divulge that market information. We are in contact with the folks that did the trade. There is no question that it is a bona fide hedger” and not someone intending to disrupt the markets. Moments after the trade, individual shares traded on markets around the country started to drop sharply, and regulators are looking at whether the trade in the futures market could have been a catalyst for the spiral. Mr. Gensler emphasized that regulators were continuing to search for the causes of the brief panic and were likely to find other trades that could also have contributed to the plunge. In singling out the trade in the Standard & Poor’s e-mini futures contract, however, regulators are suggesting they view that trading activity as critical to understanding the sequence of events that erased more than 600 points from the Dow Jones industrial average in minutes on May 6. As stock markets began to decline, regulators say they believe, other factors came into play that accelerated the fall, including the absence of circuit breakers on several electronic exchanges even as the New York Stock Exchange’s own circuit breakers kicked in. Three rival exchanges stopped routing trades to the exchange’s electronic market after they perceived technical problems there. Market experts say they believe this prompted high-frequency computer traders, who account for a vast swath of trading, to withdraw from the market. Mr. Gensler and Mary L. Schapiro, the chairwoman of the Securities and Exchange Commission, both emphasized on Tuesday that their agencies’ investigations had not yet settled on a single cause of Thursday’s volatile trading and that numerous factors could have contributed. Their comments were in testimony prepared for the House Capital Markets Subcommittee. Mr. Gensler’s comments about the potential cause were the most pointed of any regulator in the five days since the markets suffered what Ms. Schapiro called a “profoundly disappointing and troubling” break in the stock market’s stability and integrity. For now, both regulators said that they had largely ruled out several other potential causes that had been widely discussed since Thursday, including erroneous or so-called fat finger trades, unusual trading in Procter & Gamble stock, and hacker or terrorist activity. The regulators’ testimony provided the first official timeline of the events that preceded the mini-crash. At the time the futures trader entered the market at 2:32 p.m. Eastern time on Thursday, stock prices had already fallen significantly. The Dow Jones industrial average was down by about 1.5 percent by 2 p.m., Ms. Schapiro said, and Mr. Gensler noted that in the next 24 minutes, several closed-end mutual funds, which trade on stock exchanges in a manner similar to stocks, fell by 50 percent or more. Shortly after the futures trader began entering sell orders at 2:32, “the market decline began to steepen,” Ms. Schapiro said. By 2:42, the Dow was down 3.9 percent. Then, the bottom fell out, with the Dow diving nearly 5.5 percent in the next five minutes, before rebounding by about 5 percent in the next minute and a half. “Our preliminary analysis shows that this precipitous decline in stocks, and the subsequent recovery, followed very closely the drop and recovery in the value of the e-mini S.& P. 500 future, which tracks the normal relationship between futures and stock prices for the broader market,” Ms. Schapiro said. She cautioned against drawing too direct a conclusion, however. “It must be recognized, however, that the fact that stocks prices follow futures prices chronologically does not demonstrate what may have triggered the price movements,” she said. Mr. Gensler also pointed to several factors in the market for individual stocks that could have led to the market’s decline, including the overall turbulence in the global economy, particularly in Europe, which had made traders edgy. The two agencies said Tuesday that they would form a joint committee of academics, market participants and former regulators to address regulatory questions raised by last Thursday’s market turmoil. Ms. Schapiro said the S.E.C. had issued several subpoenas to unidentified people or entities to help gather information related to the market crash. She said regulators needed the subpoenas to gather information from nonregulated entities, a group that would include some hedge funds. Ms. Schapiro said the enormous increase in trading volume in recent years was complicating efforts to draw clear conclusions about the plunge. When a special commission examined the market crash of 1987, for example, investigators looked at a day when trading on the New York Stock Exchange totaled about 600 million shares. Last Thursday, 10.3 billion shares of stocks listed on the exchange changed hands. Ms. Schapiro said the S.E.C. had already begun to examine whether high-frequency traders, whose computer-driven systems trade millions of shares of stocks daily, should be subjected to stricter trading rules to protect market integrity and quality. The evolution of electronic stock markets in recent years has resulted in high-frequency traders taking over many of the market functions previously filled by stock exchange specialists and market makers who provided the bulk of stock market liquidity, Ms. Schapiro said. The major stock exchanges also testified to the subcommittee on Tuesday, with each generally pointing fingers at the others. In its testimony, the Nasdaq exchange pointed to technical problems related to the New York Stock Exchange’s electronic trading system called Arca. During the market chaos this caused three exchanges to stop routing orders to the New York Stock Exchange because of what they saw as slowness in response times or unreliable quotes being posted by the exchange. The New York Stock Exchange says there was no problem with its technology. But market experts said the decision by the exchange’s rivals — Nasdaq, BATS Trading and CBOE — to declare so-called self-help added to the nervousness of high-frequency traders who abruptly withdrew from the market. “The normal stabilizers were pushed out by the systems glitches,” said James J. Angel, a professor at Georgetown University who studies financial markets. Edward Wyatt reported from Washington and Graham Bowley from New York. Labels: brief stock market free fall, Chicago Mercantile Exchange, Dow Jones industrial average, Gensler, House hearing on Capitol Hill, Mary L. Schapiro, New York Stock Exchange, S.E.C.